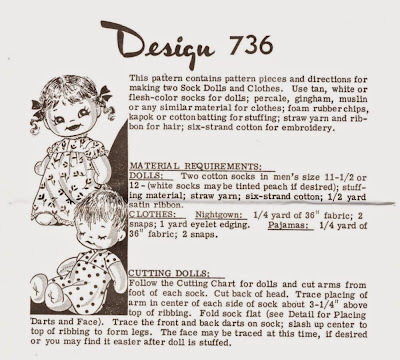 Design #736 makes a boy and girl doll from men's size 11 1/2 or 12 tan, white or flesh-color cotton socks. No publisher's name is on the pattern, but it appears to be a publication of Reader Mail, Inc., the company responsible for Laura Wheeler, Marian Martin and Alice Brooks patterns, among others. The dolls have darts for shaping their bodies. The arms and ears are made separately and attached. They have embroidered features and "straw yarn" hair. The boy is given a sleeping face, while the girl is wide awake and smiling. No size for the finished dolls is given, but they look like they would make up to be about 12" tall. 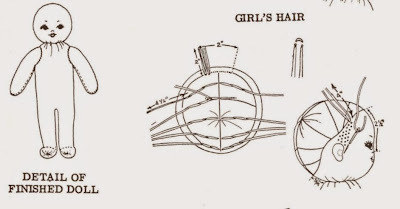 The girl doll wears a nightgown and the boy a one piece pajama. If you wanted to make daytime clothes, the nightgown could easily be shortened to a dress, and the pajama to a romper. 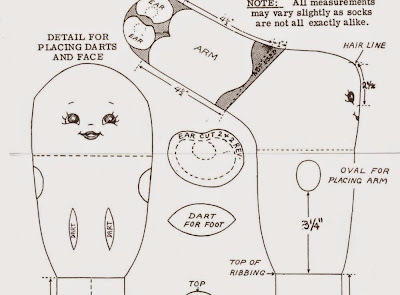 The tricky part about making these dolls might be finding the right pair of socks. Men's cotton dress socks that have no texture or ribbing would be ideal.